The problem, however, was that one the most integral links in the band’s chain wasn’t there – and won’t be coming back anytime soon. Lindsey Buckingham (singer/guitarist/songwriter) was let go by his bandmates for having irreconcilable issues about the farewell tour. He was replaced with Crowded House frontman Neil Finn and Mike Campbell, lead guitarist from Tom Petty and the Heartbreakers. Make no mistake: Buckingham’s presence was missed throughout the 21-song, two-hour performance that took the sellout crowd through a stroll down memory lane. But also make no mistake: Even without Buckingham Fleetwood Mac put on a tremendously entertaining show in likely its last performance in an arena in first played in May 1973. Finn seized the spotlight from the outset by singing “Chain,” a song that originally featured Buckingham on the microphone. Meanwhile, Campbell played the guitar riffs that Buckingham had made famous. Both were very good, but not the same as Buckingham. Fleetwood Mac’s fans were treated to a buffet of hits throughout “An Evening With Fleetwood Mac,” as nearly every song that received major airtime was belted out, many with the crowd singing along. After all, to many, Fleetwood Mac’s songs have resonated through the years, providing the soundtrack to many people’s lives. The band wasted no time playing its hits. “Little Lies” and “Say You Love Me,” which featured Christine McVie on vocals, was followed by “Dreams” and “Rhiannon” that showcased Stevie Nicks’ exquisite vocals. Fleetwood Mac also included “Black Magic Woman,” which was a hit for Carlos Santana but originally was Fleetwood Mac song from the band’s Peter Green era, in the first half of its show. Buckingham’s voice was missed for “Hold Me” and “Monday Morning,” but Finn did very well and so did Campbell, who guitar work was on point. 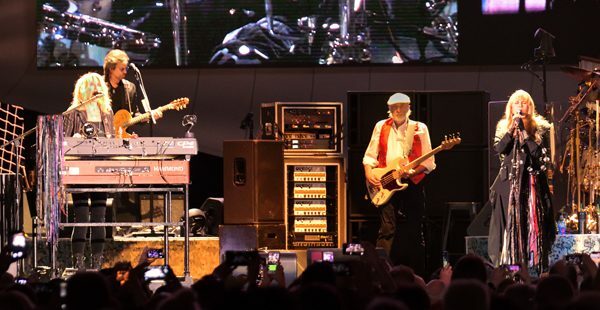 McVie brought back nostalgia with “You Make Loving Fun” before Nicks donned a gold shawl and was magnificent during a lengthy version of “Gold Dust Woman” that was the show’s pinnacle. Fleetwood Mac closed the main set with “Go Your Own Way” before Nicks channeled her inner Tom Petty and teamed with Campbell for Petty’s “Free Fallin’” to kickoff a three-song encore. Unfortunately, Fleetwood Mac won’t be doing it all over again, even though with a performance like the one on Sunday night, it easily could.